Fujiyama chefs play with fire. We can imagine the job posting for Fujiyama Japanese Steak House and Bar: "Experienced cook wanted. Responsibilities: Prepare up to 12 different meals simultaneously as you entertain customers with feats of derring-do. Ability to juggle sharp knives and firesticks a plus." 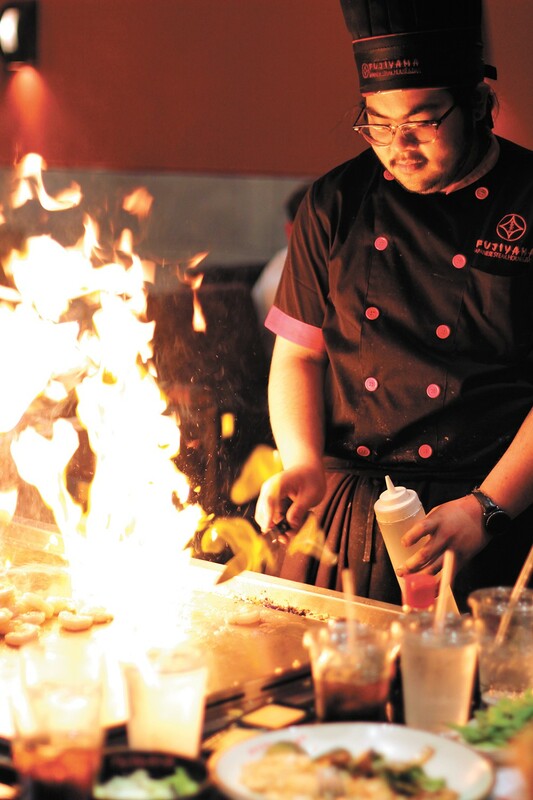 Fujiyama, like many teppanyaki-style venues, is dinner and a show. Some places cringe when a party of eight to 10 folks arrive, but not Fujiyama. Here, the more the merrier. When there are four or more people seated around a grill — each grill table accommodates 12, but between eight and nine is more comfortable — the cook appears, dressed in red and black with some variation in his or her uniform,. "Every person has a different personality," says our chef, Jalos Capada, who was only two weeks into the job as well as living in Spokane after relocating from Texas. "Everyone has a different style of cooking," he adds. Capada unveils his growing list of tricks as he prepares the meals. Pouring oil on the hot grill, for example, is an opportunity to draw a face. Cooking a conical stack of raw onion rings becomes a way to simulate a volcano. The egg he's just broken for fried rice devolves into strands of white and yellow lines as he uses it to "draw" on the hot griddle. Some tricks, however, are just frickin' cool and all about the wow factor, like working with fire. A Fujiyama chef who goes by just "AJ" likes to pop things into his hat — an egg, his spice shaker, something lit on fire. Chef "Kloud" elicits oohs and ahhs with the flick of a wrist as his conical onion stack lights up. Capada juggles firesticks. There's a lot of fire at Fujiyama, whose two sister restaurants are located in Silverdale and Richland, Washington, yet the chain has origins in the Midwest. Another location in Pullman is under different ownership. The Liberty Lake restaurant opened in midsummer. In the bar, there's a full menu and a nice assortment of Japanese beers. Appetizers are a mashup of cuisines: Japanese edamame ($5), Chinese dim sum — dough pouches stuffed with pork and shrimp ($7) — and the ubiquitous American wings, with Fujiyama's send-up of wasabi, sriracha or garlic sauce ($7.50). The original print version of this article was headlined "Entertaining Eats"